Harbour View - Governor Eugene B. Holiday paid a 3 day official visit to the Dominican Republic from April 27th to April 30th. The purpose of the visit was to promote the partnership and to strengthen ties between Sint Maarten and the Dominican Republic. 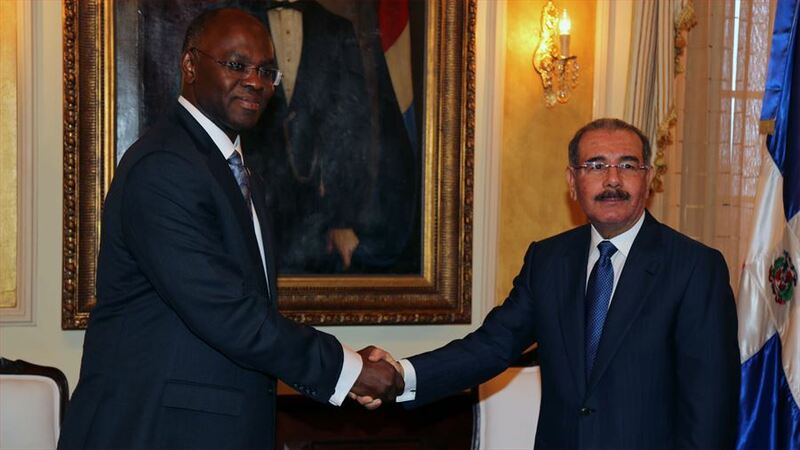 During the visit Governor Holiday was received by the President of the Dominican Republic, Mr. Danilo Medina at his presidential palace. They discussed issues of mutual interest including the potential for cooperation that benefits both countries. He also held discussions with the President of the Supreme Court, Mr. Mariano German Mejia, and the Vice Minister of the Cabinet of the President, Mrs. Zoraima Cuello, charged with disaster management. The latter provided the Governor with an outline of her ongoing disaster management initiatives and her plans to establish cooperation with other Caribbean countries in this field. The vice minister also provided the Governor with a tour and briefing of the recently established “911 emergency call and CCTV monitoring center” for the city of Santo Domingo. Governor Holiday, considering the history of the people of Sint Maarten with San Pedro de Macoris, visited the city where he was welcomed by and held talks with the Governor of the province, Mr. Felix de los Santos. Following the meeting Governor Holiday received a guided tour through San Pedro de Macoris to locations associated with the period - at the end of the 19th and the beginning of the 20th century - that large numbers of people from the English speaking Caribbean migrated to San Pedro de Macoris to work in the sugar cane industry. The guided tour included stops at, amongst others, the local museum, the fire department and three churches. Evidence of the migration of Sint Maarteners to San Pedro de Macoris in that period was found in existing records of family names from that period and was accentuated by the fact that the Governor met with people who have their roots in Sint Maarten. Governor Holiday – in addition to the governmental meetings - also visited the Zona Colonial in Santo Domingo where he received an outline about the private sector investment in the restoration of that historic area. He also received a briefing and tour of the marine terminal of Punta Caucedo, which is an important and growing container port in the Caribbean through which goods are shipped weekly to Sint Maarten. On April 29, during the final evening of his visit Governor Holiday was the guest of honor at the King’s Day reception, hosted by the Ambassador of the Kingdom of the Netherlands, Mrs. M. van Drunen Littel, where he met with officials of the Dominican government and private sector as well as with members of the Dutch Community in the Dominican Republic. In addressing the audience at the reception he highlighted the long standing friendship relations that exists between the Dominican Republic, Sint Maarten and the Kingdom of the Netherlands. He further stated that “Since becoming a country within the Kingdom in 2010, Sint Maarten has found it important to participate in regional organizations, such as the Association of Caribbean States, as well as to strengthen ties with our Caribbean neighbors to help achieve our socio-economic goals”. Referring to the strong historic and cultural ties between the peoples of Sint Maarten and The Dominican republic he stated: “This opens the door for building formal partnerships based on shared values and ideas that benefit our people and communities. That is cooperation which “can contribute to the building and maintaining of strong communities in which our citizens can live safe, free and in prosperity.”, he stated.